American Bur-reed, Sparganium americanum, is an aquatic, perennial plant that grows two to four feet high and looks a lot like a grass due to its narrow leaves (but isn’t). This member of the Cattail family grows in shallow water (up to a foot deep) in marshes and along muddy shorelines. The flower stem forms a zig-zag pattern with flower clusters at each stem juncture. The large, spherical female flowers are located on the lower part of the stem, with the smaller male flowers at the top. Considered an important plant for conservation purposes, American Bur-reed has the ability to remove nitrogen and phosphorus from wetlands. It can help prevent eutrophication by lessening the buildup of nitrogen (often from agricultural land) and phosphorus (households, industry) from runoff. One associates Beavers with a fairly strict diet of bark and twigs. While their winter diet consists primarily of woody plants, they consume a variety of herbaceous and aquatic plants (as well as woody) during the spring, summer and fall months. Shrubs and trees make up roughly half the spring and autumn requirements, but as little as 10% of the summer diet when herbaceous plants such as sedges and aquatic plants become available. 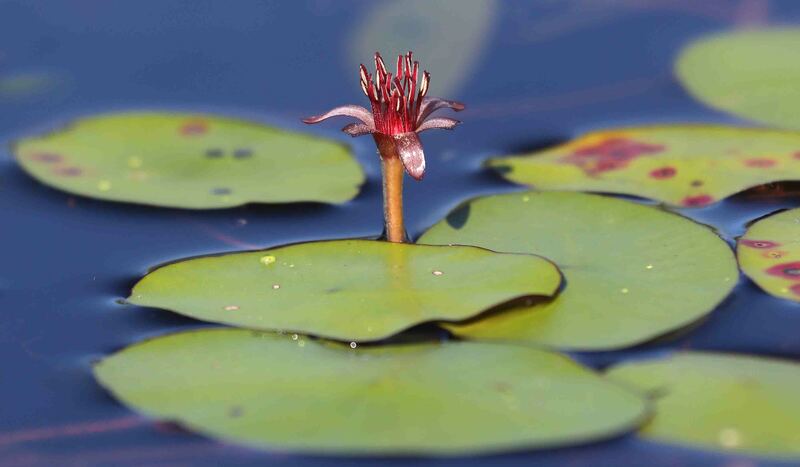 Watershield is a perennial aquatic plant whose bright green, shield-shaped leaves float on the surface of shallow water in lakes and beaver ponds. Its small purple flowers bloom from June through September, with each individual flower only lasting two days. One the first day, the female flower parts (stigma, style, ovary) are mature. After receding into the water overnight, the flower re-emerges with mature male flower parts (stamens, filaments, anthers). The anthers burst open, releasing pollen to the wind, and the flower is then withdrawn below the water where the fruit develops. The horizontal rhizomes, or stems, of Watershield, as well as the undersides of the leaves and developing buds, are covered with a thick, jelly-like slime. Botanists theorize that it may deter snails from grazing on these plants. Watershield secretes a number of chemicals that kill or inhibit growth of a wide range of bacteria, algae, and other plants.